Deception: Murder In Hong Kong Review Will You Be Deceived? I’m a bit of a Resistance apologist. It was one of the first modern board games I really enjoyed. I’ve played it easily over 100 times and got to the point where people were attempting triple-bluffs with two different friend groups. I kind of burned out on the game after a while, through sheer over-play, but I still think it’s brilliant. It’s one of the most elegant games ever made. It takes the social deduction idea, distills it down to its essential parts, and somehow emerges as something deeper and more compelling than its peers. So when a game comes out and I hear that it’s a Resistance-killer, my ears perk up a bit. I’m skeptical, for sure, but willing to give each challenger a fair shake. Spyfall was one of the early challengers, but I found it far too dependent on the players knowing all of the possible locations and everyone being very good at coming up with questions. It was frequently hilarious as an awkward-conversation creator, but far too inconsistent as a game. Secret Hitler has come the closest to matching the enjoyment of The Resistance, but that’s mostly because it’s essentially a modification of that game, though not for the best. 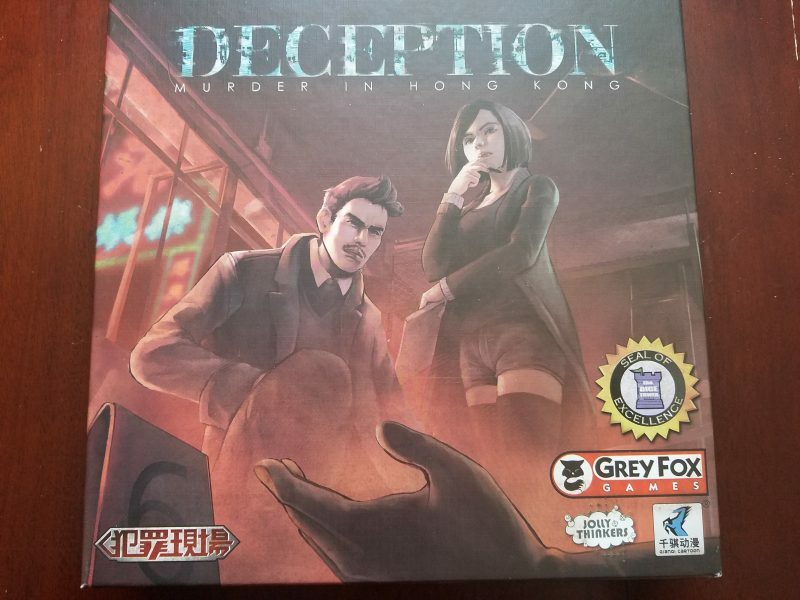 Deception: Murder In Hong Kong, from Tobey Ho and Grey Fox Games, is the newest challenger to the throne (in my house anyways–BGG says it was released in 2014). I put it on my wishlist after seeing the folks at The Dice Tower rave about it and compare it favorably against The Resistance. 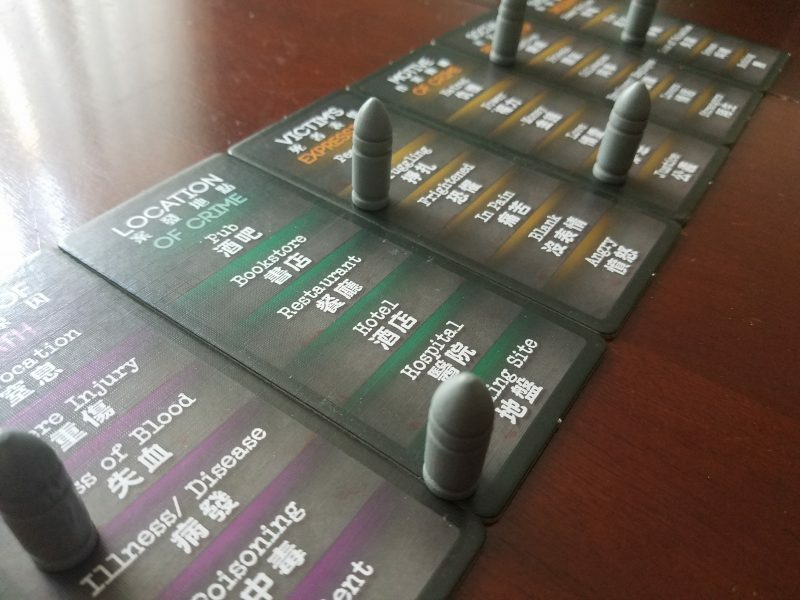 What I’ve found is that Deception is less a social deduction game and more in what I’m calling the “hindered communication” sub-genre, making it cousins with games like Codenames and Mysterium. The premise is in the title: there’s been a murder and you’ve got to figure out who it is and how they did it. 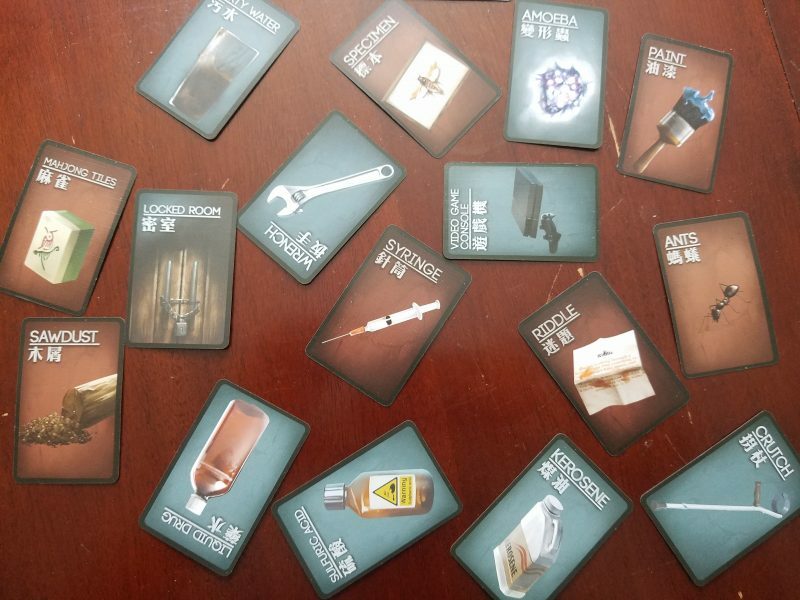 Everyone gets a set of 4 potential murder weapons/causes, and a set of 4 clues in front of them, along with a secret identity card. Just like in real life investigations, the person who gets the Forensic Scientist role knows all of the details, but can’t tell the investigator players the answer. Instead, they communicate through clue cards that provide frustratingly little information. The key that locks everything into place is the fact that the murderer player gets to choose which combination of weapon and clue the investigators have to guess. However, they have to choose from the cards in front of them. This seems like it’s going to be so important, but to extend my already bad metaphor even further, it’s not a key (or lock?) as game-congealing as you might think. Obviously the murderer has an incentive to divert attention away from the answer, but everyone wants to divert attention away from their own cards. I suppose there could be some information gained by the veracity with which they argue against their cards, but there’s not really any other opportunities to gain information about who the traitor is. The Resistance has mission results, which provide some information, but the meat of the social deduction is in the conversation of who to take on missions and the subsequent voting. Deception doesn’t have any extra layers to make the social game work. However, as a hindered communication game it’s quite good. Each of the clue cards is fashioned around a particular detail of the crime: location, features of the victim, things nearby people noticed–that kind of thing. The forensic scientist person has to pick exactly one option from the handful presented on the card. Some of them can be incredibly helpful–knowing that the murder caused a sustained, loud noise can eliminate a huge swath of the potential murder weapons. Others I haven’t seen ever provide any useful information. Of what help is knowing if the victim is short or tall? 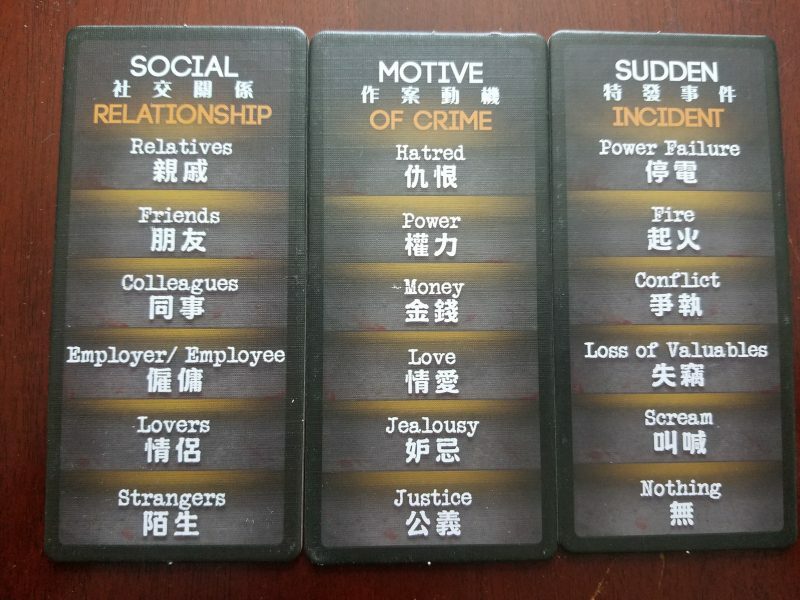 The variance in helpfulness from each of these cards can cause the difficulty of the game for the investigators to fluctuate a bit, but there are enough of them in play over the course of the game to make it not too severe of an issue. You begin with 6, and two more are swapped in as the game progresses. Each round, after an indeterminate amount of discussion, everyone’s supposed to go around and present their official hypothesis for weapon and clue within a 30 second time limit. I don’t quite understand this quirk of a rule, as it seems to create unnecessary structure. I suppose it forces people to contribute, which might help bring shy players more into the game, but it seems rather arbitrary and ends up creating more awkwardness rather than less. It also hurts whatever anemic possibilities there are for a social deduction metagame because now there’s no play in trying to hide and stay quiet as the murderer. Social deduction works when people are freed from too much structure and are given the chance to be creative with their lying and manipulating. Too much structure handcuffs the magic. I understand why you would want a time limit, because discussion can go on forever analyzing different possibilities from the vague clues. But I think it would have worked better with an overall timer rather than mandating a hypothesis carousel. Speaking of time, there’s a lot of non-game time in Deception. Most of that is spent looking over all of the cards before the game actually begins. For the murderer to select cards that’ll provide a good challenge, they need to try to hide among similar cards. To allow for that, some time needs to be set aside for everyone to just…look. The box says the game plays up to 12 people, and if that’s the case you’re looking at nearly 100 tiny cards with frustratingly small text. Even with half the number of people and cards there’s a not-insignificant amount of silent staring at the beginning of the game where only one person really cares about the information gained. Then there are three entire rounds of discussion and guesswork without a whole lot of information gained before final guesses are due. Did I mention that everyone only gets one actual guess at the right answer? That’s necessary to make the game somewhat challenging, but it makes the guessing to game time ratio very small compared to its peers. In Codenames your team gets a handful of guesses over a 10-15 minute game. In Mysterium each person gets about 7 guesses in a 45 minute game. Deception gives everyone one guess in 20 minutes of playtime at a minimum, depending on how much discussion you allow. The only new information you gain related to the group hypotheses are the new clue cards swapped in. I really do like this dynamic as the forensic scientist player has to use the new card, and has to eliminate one from the table. Do you remove a clue that everyone has already gained as much information out of as they will, to prevent them from overthinking it? Or do you remove that clue that didn’t give them anything at all? Do you try to angle your strategy towards bringing them closer to the cause of death, or the clue? Maybe you eliminate one of the clues they spent a lot of time over in the previous round, indicating that they were misleading themselves by overthinking it. Everything about it is touchy and subtle, and when you draw a clue that can’t possibly give them any information it’s frustrating in the best kind of way. But compared to the agony of being the ghost in Mysterium, the tension in Deception feels so watered down. It’s diet tension. You give some clues and hope that they figure it out. When you draw a new card you give them the best clue you can and wait. Usually the best clue is pretty obvious because the choices are so limited. I hate to compare again, but it’s hard to overstate how much Codenames and Mysterium open up the potential for creativity and truly puzzling clues when the clue-sets are the entirety of the English language and maddeningly opaque surrealist art, respectively. A final frustration I had with Deception is that with the basic rules it seems too easy for the investigators. I’ve only seen the murderer win once, and in the future I’m going to be sure to ramp up the difficulty with some of the variants described the rulebook. I might experiment with the accomplice role, even at lower player counts, to try to introduce more trickery and deceit. I hesitate to introduce even more cards to the game, but giving everyone a fifth clue and weapon might be necessary for my group to up the challenge. But the formula itself is solid and Deception is genuinely fun. This review seems harsh because Deception so easily draws comparisons to three of the best games ever made. But trying to decipher vague clues with a group of people is enjoyable. Seeing what choices the forensic scientist could have made with each clue card adds another layer of thought to the guesswork. If you group loves this style of game Deception is going to be a solid addition to your collection. Exploring some of the optional rules and variants in the rulebook might be necessary to make the game work best for you, but I’m glad the options are there. It’s not a Resistance killer or even a Mysterium killer, but I can’t deny it’s a good time. I thought the “30 second” rule was obnoxious just from reading the rules and so have never actually tried the game that way at all. I always just have the group make wild accusations at each other as the bullets are placed down, and do the 2 card swaps when discussion starts to slow down. I’ve only played with bigger groups so we always use the Accomplice and Witness rules which also helps make things more exciting!